How would you like to save anywhere from 25-75% on your heating and cooling costs? Say goodbye to expensive and time consuming fiberglass insulation and just pick up a paint roller instead! Just paint ThermaGuard on your walls to insulate your home and keep it warmer in the winter, and cooler in the summer time. ThermaGuard is designed with four separate ceramics—two are reflective, one acts as a dead air space between the coating surface and the substrate, and the fourth blocks 99.5% infrared. This makes ThermaGuard an actual “insulating” coating, not just a reflective coating that goes beyond all insulation “R’ factors. NASA tested and approved, this paint is alcohol, ammonia, and solvent free! Apply it on the inside or outside of your house and see the savings in your energy bills! Therma-Guard is a simple, two part paint system designed guard against heat loss. It will insulate and protect your walls from vapor condensation, and it’s as simple as painting your walls. The Radiant Barrier Coating is laid down first, providing a protective barrier from vapor condensation and assisting in blocking heat transfer. The Ceramic Paint is laid over the Radiant Barrier Coating, providing additional insulating value with a white paint to cover your walls and ceilings. Together, a thermal barrier prevents the transfer of heat (or cooling) keeping it where you want it, and it keeps out damaging water condensation. Any Home Advisor or Home Inspector will stress the importance of avoiding moisture damage to your walls. If your home does sustain water condensation damage, depending on the severity, you may even need to replace the drywall. Even though this is not a difficult process, you may want to find out your repair options at Home Advisor Reviews. Home Advisor Reviews offers DIY information on drywall repair as well as professional repair options. Therma-Guard Radiant Barrier Coating has two dynamic properties to keep your home warm and dry. It stops heat from entering or escaping. It’s purpose is to prevent heat “transfer” … that is the transfer of heat from a hotter object to a cooler one, like a drink does when it melts ice cubes. An example of this would be the silver foil on batts of fiberglass insulation. Our Radiant Barrier Coating contains pure aluminum pigment, which gives it a silver color and acts like that silver foil on the insulation batting. Only instead of tacking or stapling it down in your attic, all you need to do with Therma-Guard Radiant Barrier Coating is paint it on. The second dynamic property of our Radiant Barrier Coating is that it acts as a Vapor Barrier to reduce moisture accumulation and penetration. The warm air inside your house contains water vapor, which can pass into the insulation, causing significant loss of insulating value. Additionally, if that moisture gets into the building structure of your home, it can cause a lot of other unwanted problems, like growth of mold and fungus, peeling paint and even rot the wood. Therma-Guard Radiant Barrier Coating reduces the passage of water vapor, thereby reducing the potential for these associated problems. If you live in a cold climate, the Radiant Barrier Coating would be placed on the warm or the “live-in-side” of the space to be insulated. This location prevents the moisture in the warm indoor air from penetrating to the insulation, or even to the wood structure of the house. If you live in a warm climate, you would use the Radiant Barrier Coating on the outside, keeping the heat out and the cool in. Therma-Guard Radiant Barrier Coating is latex based, which means it is non-toxic and has no volatile or flammable solvents, unlike some other sprayable paints on the market. It’s also easy to cleanup. It’s so simple to use and install, unlike foils, metalized plastic film or metalized “chips”… you just paint your walls. And, the best part is, it’s extremely cost efficient. Therma-Guard paint contains ceramic properties, so when you paint your walls with Therma-Guard, you are actually insulating your walls. Ceramics are used in every area of our life because they are strong, durable, non-corrosive, non-toxic, and lightweight. They have been used in the medical industry, the electronics industry, the telecommunications industry and even in space. And, Ceramics have long been known for their insulating and heat reflecting properties. Even ancient times in the Middle East where the heat is damaging, people knew to use ceramics to keep their items cool. For instance, a clay pot that has been fired will keep liquids cool if they are cool, and hot if they are hot. This is an example of a ceramic slowing down heat loss or heat transfer. Therma-Guard helps keep your hard earned dollars in your house, instead of heating the great outdoors. It’s like adding a layer of insulation, only without the hassle or expense of installing insulation. Therma-Guard Ceramic paint comes in basic white so you can add any color pigment and design your home the way you want. Therma-Guard is simple to apply … as simple as painting your wall. It’s a vinyl acrylic, which means it’s not only easy to cleanup after you paint, but it’s easy to keep it clean with just a wipe with a damp cloth. Because of it’s ceramic content, it’s tough and durable, so it will last for years. You can use it to paint your walls and ceilings. It contains an insulating ceramic that slows down heat loss and keeps the heat where you want it … inside. Therma-Guard is a simple, two part paint system designed to guard against heat loss. It insulates and protects your walls from vapor condensation. The Radiant Barrier silver coating is applied first, providing a protective barrier. The Ceramic Paint is applied over the Radiant Barrier coating to provide additional insulating value and it's white so you can leave it white or tint it to your liking, then cover your walls and ceilings. Our Radiant Barrier Coating contains pure aluminum pigment, which gives it a silver color and acts like that silver foil on the insulation batting. Only instead of tacking or stapling it down in your attic, all you need to do with Therma-Guard Radiant Barrier Coating is paint it on. The second dynamic property of our Radiant Barrier Coating is that it acts as a Vapor Barrier to reduce moisture accumulation and penetration. The warm air inside your house contains water vapor, which can pass into the insulation, causing significant loss of insulating value. Additionally, if that moisture gets into the building structure of your home, it can cause a lot of other unwanted problems, like growth of mold and fungus, peeling paint and even rot the wood. The Radiant Barrier Coating reduces the passage of water vapor, thereby reducing the potential for these associated problems. If you live in a cold climate, the Radiant Barrier Coating would be placed on the warm or the "live-in-side" of the space to be insulated. This location prevents the moisture in the warm indoor air from penetrating to the insulation, or even to the wood structure of the house. If you live in a warm climate, you would use the Radiant Barrier Coating on the outside, keeping the heat out and the cool in. Therma-Guard Radiant Barrier Coating is latex based, which means it is non-toxic and has no volatile or flammable solvents, unlike some other sprayable paints on the market. It's also easy to cleanup. It's so simple to use and install, unlike foils, metalized plastic film or metalized "chips" - you just paint your walls. And, the best part is, it's extremely cost efficient. As a Radiant Barrier: Stops heat from entering or escaping. Until now the only types of radiant barriers available were foil film, metalized plastic film, and metalized "chips" . These types of barriers are installed by attaching to the underside of the roof with staples or sprinkled about on top of the fiberglass insulation on the attic floor. There are a few sprayable paint coatings available that are sold as radiant barriers but they all contain volatile solvents which are not only hazardous to the installer but also to the homeowner as the toxic fumes penetrate down through the ceilings and into the interior. Don't be fooled by the terms "latex base", "water cleanup" as they do not reflect the true chemical makeup of the coating, read the ingredients! Therma-Guard Radiant Barrier is a radiant barrier paint that contains pure metal (aluminum) pigment and NO mineral spirits or other volatile, flammable solvents. Moisture can cause problems with thermal insulation. The warm air inside your house contains water vapor. If this vapor passes into the insulation and condenses, it can cause significant loss of insulating value. If moisture becomes deposited in the building structure, it can cause a lot of other problems, mold growth, peeling paint, and eventual rotting of structural wood. Vapor consist of special materials that reduce the passage of water vapor. Vapor barriers should be used in most parts of the country. In colder climates, place the barrier on the warm side--the lived-in side--of the space to be insulated. This location prevents the moisture in the warm indoor air from reaching the insulation. If you live in an area where the climate is predominantly hot and humid, check with a local builder to determine the correct placement for a barrier. Square foot cost is low. Easily applied to Duct work, Pipes, interiors of cargo transportation vehicles, barns, storage buildings, animal shelters, grain silos, poultry housing, Attic Space, underside of roof decking, side walls and overhead doors in metal building. There are many applications. Easily installed using airless or conventional air atomization spray equipment. Saves money by lowering heating and cooling cost. It not only provides a superior radiant barrier but also protection of the wood from rotting. You can do this yourself and save money. It also helps to increase interior lighting levels, due to the reflectivity of the coating which aids in reducing lighting costs. Especially in buildings heated by infrared heaters, wood burning stoves or other radiant heat sources, Radiant Barrier greatly improves the efficiency of the heat source reducing fuel and energy costs. On interior wall applications Radiant Barrier not only provides a barrier to radiated heat but also an Aluminum vapor barrier which reduces water vapor transfer through the walls, a real plus for older homes and homes with EIFS wall systems. Radiant Barrier offers Dual protection: Aluminum pigment blocks radiant heat and, Insulating ceramics reduce heat transfer by means of conduction. Radiant Barrier contains No ammonia, No alcohol, No solvents! Therma-Guard Ceramic Paint comes in basic white, so you can add any color pigment to it to design your home the way you want. Therma-Guard is simple to apply as simple as painting your wall. The white component is a vinyl acrylic, which means it's not only easy to cleanup after you paint, but it's easy to keep it clean with just a wipe with a damp cloth. Because of it's ceramic content, it's tough and durable, so it will last for years. You can use it to paint your walls and ceilings. It contains an insulating ceramic that slows down heat loss and keeps the heat where you want it inside. The temperature on the outside of the pipes was reduced by 45% ! The reduction rate has reduced the boiler run time from 2 hours down to 20 minutes ! I highly recommend your product. We Beat the Texas Heat ! AWESOME! That's all I can say about Therma Guard products. I am building a new wood frame building here in Houston and decided to use Therma Guard products. We set-up temperature monitors inside the building so that we could compare before and after temps. Our first application was the spraying of the underside of the roof decking,. (barrier & 2 coats white) The interior temperature dropped a whopping 18 degrees !!! We sprayed the exterior walls with Therma Guard silver and tinted white and the interior temperature dropped another 7 degrees ! And Home Owners Worldwide ! With Therma-Guard you'll save energy and money! Question: What is the "R" value? Answer: R-values are measured by testing laboratories who use, ASTM (American Society of Testing and Materials) procedures. Existing test procedures require that the sample submitted be 1" thick, therefore paints and coatings cannot be tested using established test methods. We just do our egg test as seen in the Therma-Guard Video that proves how effective the barrier is and let you (our customers) draw their own conclusions. Question: Do ceramics prevent the paint from breathing? Answer: A paint coating's ability to breath is known as "Permeability" which is a measurement of the rate that water or vapor will pass through a membrane. Ceramic filled paints do not restrict a single "breath. Question: What colors are available? Answer: Therma Guard is a ready mixed paint and comes to you in a bright white, tintable base only. You can have the paints tinted locally to the color of your choosing in pastel and mid range colors. Our paints will accept all universal tints and this way you can see the exact color you are getting and make any necessary adjustments. Another option is to use TG Cells with your own locally bought paint. Question: How much paint do I need? Answer: You can figure that the average spread rate is 300 to 400 sq. ft per U.S. gallon over a fairly smooth surface. If you are painting over popcorn ceilings or rough Spanish style stucco, DOUBLE the amount of paint. Your actual spread rate will vary depending on the surface irregularities, porosity and material loss when mixing. Question: Do Insulating paints work in the summer & winter months? Answer: Yes! Heat outside is blocked from transfer to cool walls inside in the summer. The heat inside your home is blocked from escape toward the cold outside air in winter. A paint film of Therma Guard reflective ceramics will help slow this heat transfer in both directions to lower your cooling and heating bills. Question: What kind of paint can be used over the thermal paint? Answer: Choose either the flat or the latex, whichever fits your needs. The insulating characteristics of your Therma Guard ceramics are unchanged. Question: How many coats of paint should I apply? Answer: Therma Guard is a 2 part system. For best results, 1 coat of the silver radiant barrier and then 2 coats of white are recommended to insure an even distribution of the ceramics. Question: Should I use Insulating paint both inside and outside? Answer: Yes! For the optimum in energy efficiency it is best to use Insulating paints both inside and out, however either application alone will increase your energy efficiency. Experience has shown the best value is to place the Therma Guard system on the warmer surface. ie: outside in southern climates and inside in northern climates. Question: Can I spray paint? Answer: Yes! Simply remove all filters from your spray equipment (or they will strain out the additive) and use a slightly larger spray tip than normal. Recommended tip sizes are .019 - .025. Question: Does the paint contain harmful chemicals? Answer: Therma Guard is free of all Volatile chemicals and toxins and is recognized as safe, under the Federal Food, Drug, and Cosmetic Act. Non-toxic, odor free and environmentally friendly. Question: Can I paint my attic with Insulating Paint? Answer: Absolutely! By restricting the amount of heat allowed into your attic you reduce the load on your existing insulation making it more effective. Question: Can we guarantee your utility bills will be cut by 30%, 40% or even 50%? Answer: Absolutely not ! Anyone that tells you they can is not telling the truth. The results depend on how many areas of your home you apply the various products to, other considerations include, amount of attic ventilation, amount of air infiltration into your home, type of roofing materials, and on and on. We have several anecdotal statements from satisfied customers we can provide if requested. We can also assure you that for the 30-40 cents /sq ft it costs to apply Therma Guard Insulating Paint you will not find a better solution to your high utility bills for that price. Question: What is the difference between using TG Cells ceramic insulating additive and my paint vs. pre-mixed Therma Guard Insulating Paint? Answer: To better understand the answer to this question you need to understand the basics of paint formulations. Basic latex paint is nothing more than a pigment, water, a binder to hold it all together and additives which can be added to improve flow and leveling, eliminate bubbles, mildewcides etc. 3.) Enough vehicle, (water in latex paints and solvent in oil base paints) to insure easy flowing and workability. The finished product is a balanced blend of the three basic ingredients quality depending on type of pigment used, amount of water and type of resin which is why there is quite a spread in paint prices. TG Cells mixed with your top quality paint should perform equivalently. The main advantage you gain in adding TG Cells to your own paint is the reduced shipping costs and you actually gain a little more coverage area per gallon due to adding a little water. (See next FAQ) But you should still apply the silver radiant barrier coat first. Question: How do I mix TG Cells with paint I buy locally ? Answer: When you add the recommended 32 oz (by volume), 1 gallon package, per gallon to a can of ready mixed paint you are upsetting the balance of pigment vs. water that the formulator originally based his "recipe" on. This makes the paint thicker which requires the addition of water in order to insure easy flow and leveling, and you are requiring the binder or resin to hold into place a greater volume of pigment. It sounds pretty bad, but not really. First of all adding 1/2 to 1 pint of water to a gallon of paint is not going to make or break its properties. Ceramics being micro ball bearings will improve flow and leveling. The hard ceramic shell resists dirt pickup and improves durability. NOTE: It is easiest to mix TG Cells with your paint in a 5 gallon bucket with a power stirrer. Test Results: We took four different brands of medium priced interior wall paints and added 32 oz of Therma Guard ceramic additive, reduced the paints with 1/2 - 1 pint of water to bring back the original viscosity and performed side by side scrub tests to compare the original paint with the ceramic reinforced paint. In each and every case the ceramic filled paint outperformed the original paint ! Description: Barrier Coat #85 is an insulating radiant barrier paint made of ground metallic aluminum pigment blended into an acrylic polymer vehicle along with the Insulating Ceramic. Barrier Coat is designed for use as a radiant barrier coating for attics and also a superior water vapor barrier when applied to side-walls preventing "in the wall" condensation buildup due to water vapor transmission. The elimination of "in the wall" condensation improves existing insulation properties by keeping the insulation dry. Wall vapor barriers also eliminate peeling paint due to vapor transfer from inside to outside wall surfaces. Tests show that Radiant barriers can reduce summer ceiling heat gains by up to 42 percent compared to an attic with the same insulation level and no radiant barrier. Barrier Coat boasts a pure 0% VOC pigment in an environmentally friendly water base formula. Application: Barrier Coat #85 is supplied ready to use and may be applied by brush, roller, or conventional airless spray equipment. If spray applied all filters must be removed so as to not strain our the insulating ceramics, tip size .019-.021. Two coats are recommended with a short dry time between coats. Coverage rates-250-300 sq ft per gallon. Standard color for the first coat (silver paint) is aluminum/ gray. Soap & Water. Should be done immediately. Cure Times: When applied at conditions of 75° F (24° C) and 50% relative humidity, dries to the touch in 2 hours, and should reach final cure in 24 hours. Colder weather and/ or higher humidity will retard curing. Therma Guard insulating house paint will protect, waterproof and seal while providing space age ceramic paint insulation technology. Our interior/ exterior ceramic house paints provide the ultimate in product performance and ease of application. Are free of lead, chromate and mercury hazards. Latex Ceramic House Paint Therma Guard Insulating flat is a very high hiding 100% acrylic insulating house paint that provides excellent durability on a variety of architectural surfaces. Mildew and fade resistant, (Treated with fungicide to resist mildew growth on the product film), this paint is formulated to provide minimal spatter and excellent coverage. It hides minor surface imperfections and dries quickly to a smooth matt finish. It's pre-mixed at the factory with insulating ceramics, simply open the can and apply a heat reflecting coating to your walls. Application is identical to ordinary flat house paint but with the added advantage of energy saving Therma-Guard ceramic microspheres and their insulating properties. Heavy concentration of insulating ceramics. May be applied by brush, roller, conventional spray or airless spray. Color: White, Can be tinted locally to pastel and mid range colors. Recommend Uses and Application: For use on walls and ceilings over a wide variety of surfaces such as primed drywall, plaster, acoustical tiles, drop in ceiling panels, popcorn ceilings, concrete, stucco, brick, masonry, primed metal and wood. Excellent for apartments, condominiums, warehouses, motels, offices and residential buildings. Q: What is the difference between using TG Cells insulating additive and my paint vs. pre-mixed Therma Guard White insulating paint? Please see the Therma Guard FAQs sheet for additional explanation of this question. NOTE 1. Remember that Therma Guard was designed as a 2 part system. Use the silver radiant barrier coat first then the white (or your paint fortified with TG Cells). NOTE 2. 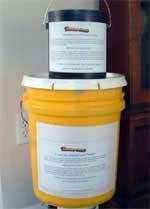 It is easiest to mix TG Cells with your paint in a 5 gallon bucket with a power stirrer. Being lightweight shipping fees are reduced. No waste, use what you need now and store the remaining ceramic additive for future painting projects. When we formulate a paint from scratch we are able to include a very high percentage of insulating ceramics to our blend with just enough other pigments to insure good covering and hiding power. Number 1 grade titanium is our pigment of choice due to its efficiency in scattering visible light, imparting whiteness, brightness, and high opacity. We minimize the water content and load our formulas with a very high concentration of resins each selected for the what is required of that paints application. 1. Higher concentration of ceramics for increased insulation and durability. 2. A higher percentage of long lasting resin than most other paints. 3. Minimum amount of water. 4. Economical, take the price of a gallon of premium quality paint, add the cost of an additive, the total is generally more than one of our pre-mixed Therma Guard insulating paints which gives you more insulating ceramics per square foot of applied product. 5. Convenience, no mixing, simply open the can and "Brush away your high "
Whatever your choice, adding TG Cells to your own paint or using Therma Guard pre-mixed insulating paints, the end result is you will be saving money on your heating and cooling bills, reducing sound and providing the painted surface with a durable long lasting ceramic finish. You just need to apply them! NOTE: You must buy both components and apply first Silver and then White for the application to work. You will notice a new product called TG Cells. They are the same ceramic spheres contained in the silver and white paints. They can simply be mixed with whatever color and finish of paint you choose locally. TG Cells give equivalent results to Therma Guard White, but you should still order the silver as the base coat.